Flappy Bird was a phenomenon on mobile devices in early 2014 and was noted for its rock hard, yet addictive gameplay. 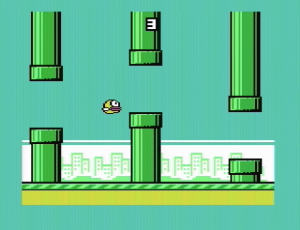 The game sees you controlling a flying bird through a never-ending series of pipes (that look exactly like the ones in Super Mario Bros) in an attempt to stay alive as long as possible. If you hit a pipe it's game over. You control the bird by tapping the fire button to go up - the problem is that your character constantly nosedives which makes precise movements difficult. This is obviously part of the challenge but for me it was much more stressful than other scrolling high score games such as Up Up and Away on the Atari 8-bit. There is also a lack of music and very little in the way of sound effects. Although the game can be somewhat addictive, this is simply a high score contest with very little to keep the players' interest. The scenery doesn't change whatsoever and there are no levels or other obstacles to switch things up. In my opinion this could have been a very interesting game if it was more fleshed out. As it stands though it's just extremely barebones. Although this is a nicely programmed port, Flappy Bird just isn't for me. It's too shallow and the lack of variety makes for a boring gaming experience. If you like the original mobile game though I doubt this port will disappoint you. Random trivia: Despite earning $50,000 per day for in-app advertisements, Flappy Bird creator Dong Nguyen pulled the game from iOS and Android due to death threats from players who said the game was too difficult and addictive!